Toronto Blue Jays general manager Ross Atkins attends a news conference in Toronto, on Sept. 26, 2018. 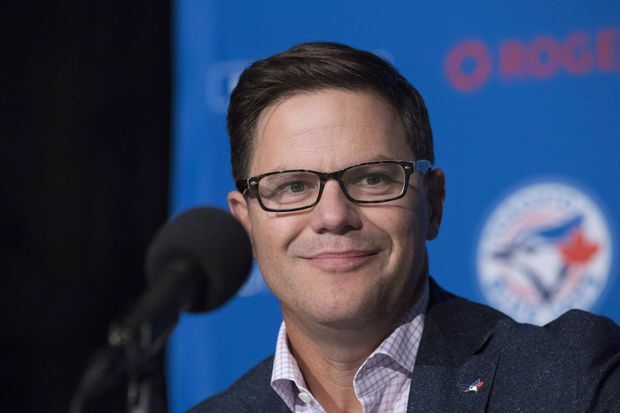 In the wake of acquiring pitchers Clayton Richard and Matt Shoemaker, Blue Jays GM Ross Atkins says he is still open to more moves. The priority remains more pitching depth. “It could be in the form of starting [pitching], it could be in the former of [a] reliever,” Atkins said in a media conference call Monday. “And we’ll continue to consider any opportunities to move players potentially off of our roster,” he added. “It’s not something that we are pro-actively looking to do, but we do have a great number of players that other teams are interested in. Most of the talk has been about players on shorter-team deals or those that Toronto has less control over their future, he said. Atkins seems willing to listen to all offers. “We like the players that we have. But at the same time, if there is an upgrade, then those are sometimes decisions you have to make,” he said. “There’s a lot of off-season left for us and a lot of opportunities that we’ll continue to flesh out,” he added. Toronto got the left-handed Richard in a deal Sunday with San Diego after signing Shoemaker, a right-handed free agent, to a one-year deal worth US$3.5 million on Friday. The Jays sent outfielder Connor Panas to the Padres in exchange for Richard and cash considerations. Richard and Shoemaker are both candidates to join a starting rotation that includes Marcus Stroman, Aaron Sanchez and Ryan Borucki. Rookies Sean Reid-Foley, Thomas Pannone and Trent Thornton will also be looking to make their mark. Both new pitchers are coming off injuries – forearm for Richard and knee for Shoemaker. But Atkins says the two will be ready for spring training. The 35-year-old Richard went 7-11 with a 5.33 earned-run average in 27 starts for the Padres in 2018. His career record is 68-79 with a 4.46 ERA since making his debut in 2008. The 6-foot-5 240-pounder posted a National League-best 60.3 ground ball percentage over the past four seasons. He missed the end of last season because of knee surgery. “Very, very well respected. A very solid human being,” Atkins said. Shoemaker went 2-2 with a 4.94 ERA across seven starts with the Los Angeles Angels during the 2018 season when he spent time on the disabled list with a right forearm strain. The 32-year-old has a career record of 40-32 with a 3.93 ERA in six seasons with the Angels. Jays pitchers and catchers are slated to have their first workout on Feb. 14 with the whole team at camp Feb. 18. Many familiar names are missing thanks to a teardown that started last season. Gone are the likes of Troy Tulowitzki, Josh Donaldson, J.A. Happ, Roberto Osuna, Seunghwan Oh, Steve Pearce, John Axford, Aaron Loup and Aledmys Diaz. Marco Estrada, Yangervis Solarte and Tyler Clippard left as free agents. Charlie Montoyo has taken over as manager, succeeding John Gibbons. Atkins said he expects Montoyo to help the team’s young infielders improve their defence, saying it’s an area where the club needs to get better. “He has a track record of doing it, he’s passionate about it,” said the GM, who pointed to the middle infield as the most pressing area for defensive improvement.